One of the first sayings, I’ve learnt in my studies of media and communication: «Bad news are good news». Afaik, the SA govt. didn’t publish crime reports during the World Cup. If it’s true, it might be one reason that the media didn’t focussed on crime as it habitually do. Ali, it’s possible that crime reports weren’t published – but journalists have ways of finding out about crime. I’m not implying a conspiracy theory, but it was strange that there was so little bad news. I thought about it afterwards and wondered how it would work if just one television channel decided to change all it’s news into positive news – and report on nothing negative. Some may argue that this kind of attitude is just about hiding your head in the sand, but I don’t believe it is. Of course, Paul, but the question is: Would journalists do use their possibilities? 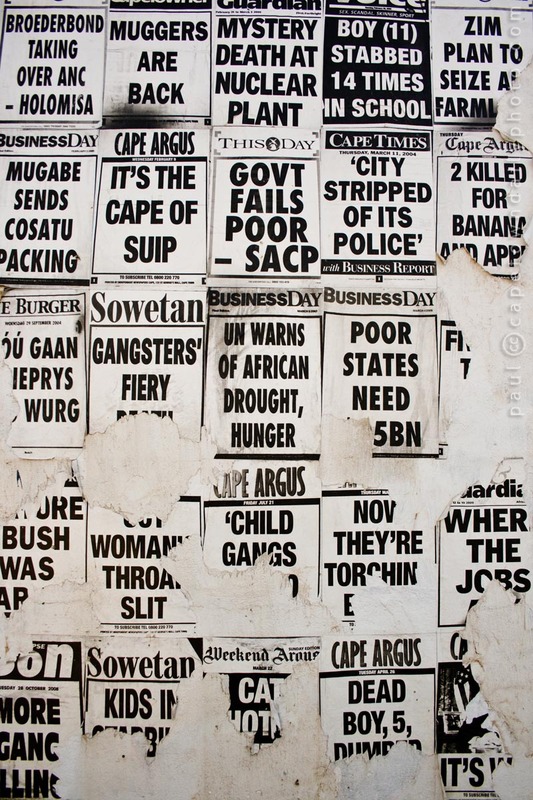 From my internship in SA I’ve learnt that SA’s media system suffers (from?) the same lacks of professionalism and resources as the German one does, maybe more serious. During the World Cup, one widely read only about mugging on journalists in German newspapers. Very often, newspapers only used the reports which was published by news agencies. The reason, I think, is clear. All the foreign media workers had only few contacts to South Africans. The German channel ARD, e.g. deployed 600 workers in SA. They majority only reported about the WC. What kind of internship did you do – if I may ask? Yeah, it’s a pitty that so few of those German journalists got to see anything else. They could have had such an awesome time! You may ask. :) I did an internship with the Sub-Saharan Africa Media Programme of German Konrad Adenauer Foundation, based in Joburg. It deals with media topics in SSA, e.g. by organizing conferencing and workshops with the objective to boost media freedom and professionalism. During my stay, i did for example some research about South Africa’s media freedom, intended for a publication on consolidation of SA’s democracy. Of course, in relation to other African countries, the media system is great. South Africa has one of the best constitutions of the world and, and, up to now, the political system allows the watchdog to do its work. 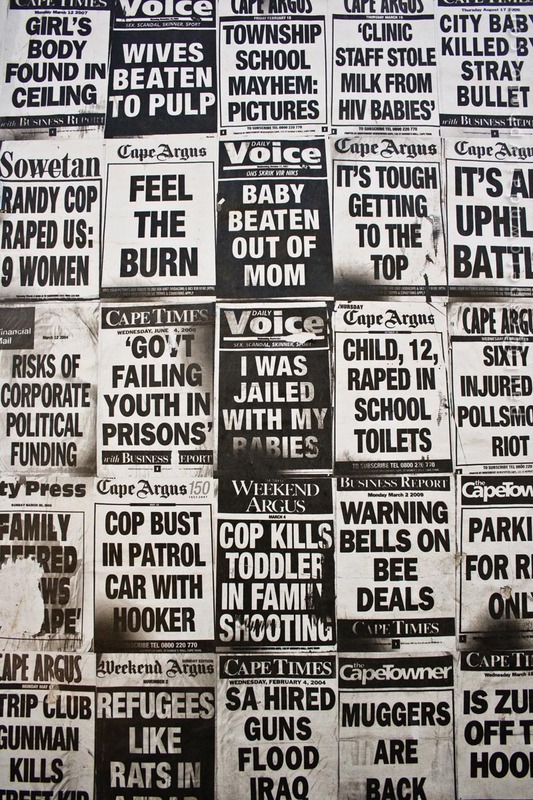 But very often, South African journalists violate ethic standards by, e.g. naming of victims and criminals, working on topics in an inappropriate tabloid style and so on. Before the WC started, South Africa’s media had an important discussion about Fifa’s stranglehold related to news coverage or accreditation of journalists. In the Foundation, we tried to get a copy of accreditation agreement but no one (i.a. Mail & Guardian) was able to present us a copy. The reason: At this point (I think around February), they just didn’t have the agreement. In my opinion, if I want to participate seriously in a topic, I should know what the people are talking about. I think it’s some kind of social/political commentary. From my time involved with CTs hip hop movement, I know that graffiti can be used as a social/political communication tool. I drove past this today and I think it’s part of a theme. If you go further down Voortrekker, toward town, you’ll see another piece with an angel bent over a sarcophagus with the words Freedom Charter on the side. Thanks Nathan – check out the comments on this post. Someone directed me to her blog and I then found a site with some of her other work listed.